Take out the old band shirts; put your faded skinny jeans into your white sneakers and get back on track! Get ready to meet metal-warriors, punks and progheads, ‘cause tonight Blackslash’s live on stage. Applauding, singing along to an epic chorus and draining tinned beer – that’s what it’s all about. When your old Sabbath-shirt is nothing more than a sweated rag, you know that Blackslash are the ones to save your hope for an 80’s revival of Heavy Metal of the glorious days. 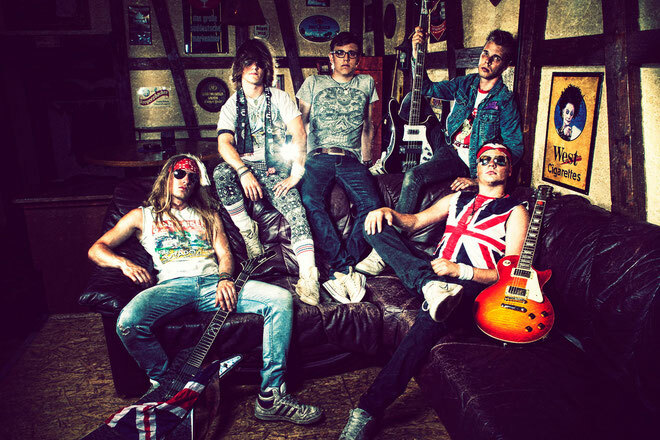 Though the young band from Donaueschingen, Black Forest, Germany, was founded in 2007, they play the music your parents used to listen to (and were told not to listen). Old-School-Heavy-Metal, that’s what the five guys around bass player Alec Trojan stand for. And by playing neckbreaking concerts they give evidence to that. At this a galloping bass reminds you on Iron Maiden; two-part guitars let you travel time into the golden era of Thin Lizzy, while the melodious singing of front man Clemens Haas takes control over your mind. A faithful and steadily growing fan crowd is astonished every concert by the ease Christian Haas is stroking the strings with, to push his amps to the limit supported by a second guitar Daniel Hölderle. Meanwhile David Hofmeier tortures his drums to end up in a climax of dynamic and speed. The fact that Blackslash is not about smooth-edged pop music is approved by their fans since the release of their “Blackslash EP” in 2011. The rough and edgy Heavy-Metal disc seemed to have the finger right on the pulse and touched the nerve of the bored lunatics and winos around the South of Germany. After just a few concerts the record was sold out and therefore Blackslash started planning their debut album that winter. By the release of “Separate But Equal” they succeeded in becoming the most charismatic rock act in their region and attracted the local’s press attention to themselves.